New Year's Message: African Greens Federation will grow stronger in 2017. The African Greens Federation wishes to thank all its members and partners for the great achievements realized during 2016 and looks forward to greater accomplishments in 2017. During 2016, AGF strengthened and consolidated its regional structures by conducting several capacity building workshops and congresses in all the different five African regions. Elections and environmental training workshop for the North African Greens Federation, held in Rabat/Morocco in February 2016. This training brought together parties from Egypt, Tunisia, Morocco and Algeria. The NAGF President had an opportunity to meet with the leader of Green Left Party in Morocco and later recommended their admission into the African Greens Federation. Elections and campaigns training for the Central African Greens Federation, held in N’Djamena/Chad, between 23rd and 24th July. This training brought together parties from the Democratic Republic of Congo, Central Africa Republic, Chad and the Republic of Congo. North African Greens Federation training on climate change in Algeria from, 28th July- 2nd August. The training brought together parties from Tunisia, Morocco (Green Left), Algeria and AGF representatives from Burkina Faso and Niger. This meeting was also attended by the Global Greens Secretary. AGF equally supported the Southern Africa Greens Federation training on elections and campaigns which was held in Mauritius from the 11th- 13th August 2016. This training was attended by parties from Mozambique, Zambia, Zimbabwe, Madagascar and Mauritius. AGF President also attended this meeting. 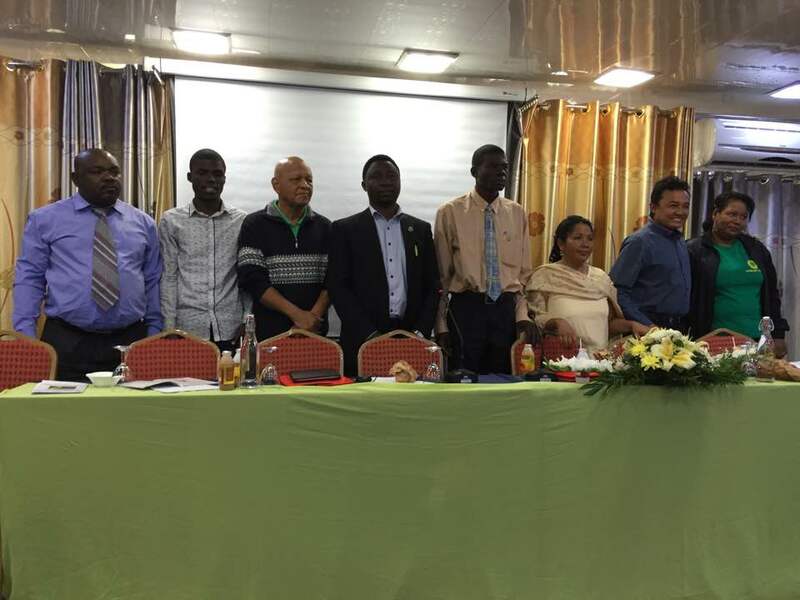 A regional congress was held at the end of the training and a new executive committee was elected, led by Mr.Sylvio Michel, leader of Mauritius Greens. Green Forum also supported AGF’s administrative activities which included: the organizational audit for the Secretariat accounts for 2015, maintenance of the continental Secretariat in Burkina Faso, Monitoring and Evaluation activities. AGF signed a new cooperation agreement in March 2016 with Groen Party from Belgium, the new partnership is aimed at supporting the West African Greens Federation. With support from Groen/Belgium, AGF conducted a regional training on elections and campaigns for the West African Greens Federation in Mali, from 27th-29th May 2016. The training brought together Green Parties from: Senegal, Burkina Faso, Togo, Ivory Coast, Niger and Mali-the host country. The leader of Green Left-Morocco and AGF president were also present. AGF also organized an African Greens Academy and congress in Niamey, Niger from 15th -18th December 2016 for the West African Greens Federation. Participants came from: Burkina Faso, Niger, Senegal, Togo, Niger, Mali and Ivory Coast. The congress elected new office bearers led by Ms.Fadimata Bintu Toure from Mali. AGF signed another cooperation agreement in 2016, with the Westminster Foundation for Democracy-UK in partnership with the Green Party of England and Wales (GPEW), aimed at supporting the East African Greens Federation. With support from Westminster Foundation and GPEW, AGF organized a regional media training workshop in Nairobi Kenya, in February 2016. A regional meeting was held after this training and an action plan for the East African region was adopted. This meeting brought together Parties from Uganda, Rwanda and Kenya. The facilitators were from the Green Party of England and Wales. The East African Greens federation also organized a training on elections and campaigns in Kigali, Rwanda, from 13th-14th December 2016. After the training, a congress was held and new executive committee members were elected. The new committee is led by Mr.Thomas Kentos Bakyayita from Uganda. The facilitator was a well-known Rwandan University don and writer in the regional newspaper: The East African. AGF equally organized the first East African Women Greens training workshop in Kigali, Rwanda, from 15th -16th December 2016. Members elected a Women Greens committee for East Africa and its led by Ms.Dorothy Nalubega from Uganda. The facilitator came from Finland. AGF accomplished a lot during 2016, but a lot more is still desired in 2017. Several member parties still face a challenge of competing fairly with traditional parties during elections. It’s imperative that we support them in any way we can, so that, the Green Ideology could have a chance of getting integrated into national policies and programs on the African continent. On behalf of the African Greens Federation, we wish to thank you all for supporting the growth of the Green Movement in Africa and wish you all a joyful holiday season and a prosperous new year 2017, may it be a year of greater realizations.